And to those who say that it is spending, not savings, which creates income: there can be no economy of exchange until another has adequately developed his or her savings to compete for mine. Furthermore, there is naturally nothing to spend or consume until it is harvested.﻿ One can easily consume. Production is the hard part. Unfortunately, the global economy has begun to operate from the belief that consumption -- otherwise called demand or spending -- can drive an economy. For this reason, much of the developed world, which has for generations benefitted from large surpluses of savings because of plentiful production, has both squandered its savings and encouraged unscrupulous lending, leveraging, and spending to "stimulate" economic growth. 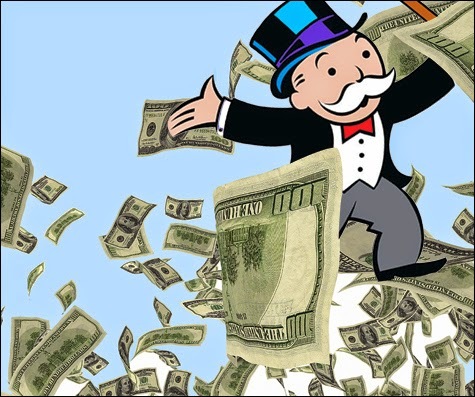 The rest of this article explains the myth of spending (or printing) your way to prosperity, and how this outlook distorts the marketplace and eventually leads to the absolute collapse of civilizations' standards of living. At first glance, one may assess commerce and suggest that one's spending is another's income, and that one's wealth is therefore predicated upon the community's propensity to spend or consume. Indeed, someone's transference of cash in return for goods or services will drive the vendor's paper assets, but the vendor's standard of living depends not upon mere paper assets, but upon the equivalent level of expected liquidity in the future, which can be satisfied only by equivalent or improved levels of production in the marketplace, which sustains and advances purchasing power. Many of today's talking heads wish to report on the failures of capitalism and its creation of income inequality in the United States. In short, these stories are popular because they sympathize with the majority of the men and women who are not entrepreneurs but laborers who continue to work for fixed wages or salaries while the Federal Reserve and political pundits in Washington destroy the value of their savings through taxation, regulation and inflation, or today's politically-correct form of quantitative easing; however, these accusations are nothing more than convenient headlines for newspapers and TV shows whose primary interests include ratings, purchases, and viewership before objective reporting. First, let's be clear: the United States of America operates within the confines of a mere vestige of capitalism. The U.S. market is more accurately a synthesis of socialism, corporatism, and crony capitalism: a system of corporate interests influencing government policy and its ownership and regulation over means of production, distribution, and exchange. This is the mechanism through which wealth has been largely concentrated within the classes of those who offer either power or influence. Finally, many neglect these truisms to instead beg for the somehow-righteous redistribution of wealth, from those so-called greedy capitalists who have done "nothing more than to stumble into their wealth" to those who "actually work for a living." First, most of the successful entrepreneurs within a civilization have been able to achieve riches by satisfying popular demand through affordable and useful goods and services. Second, if one is to search for the cause of this gross distortion of wealth distribution, he or she need not look much further than the previous paragraph to discover its origin: government. Third, if those so-called abstinent hoarders of wealth were to chase or compete for more of the market's scarce goods and services, their appearance on the market would invariably cause an upward adjustment in costs, effectively outbidding lower wage-earners and forcing them into inferior goods and to live below their prior respective standards of living. Let's go further to evaluate the dynamics between the debtor and the creditor. The creditor here reduces his savings, effectively sacrificing immediate gratification and consumption of supply, to enable the immediate consumption or investment of another. There is, of course, a time value of money which assigns a premium to the cost of borrowing in this scenario. The creditor assumes that, in the fulfillment of this contract, the extent of his later or protracted satisfaction will outweigh the extent of potential immediate consumption offered by this sum of savings. The debtor assigns greater value to his immediate consumption or investment in such a manner that his measured reduction of supply or consumption in the future, which is reduced by his satisfaction of payments on principal and interest pursuant to this obligation, will be outweighed by the value of his instant gratification or by the extent of value added by equity in his investments. The process is never complete until the terms of these contracts are satisfied. A nominal satisfaction of terms, as too many are willing to accept as actual satisfaction, is relevant only insofar as it concerns legal and contractual obligations. Economically, however, the real satisfaction of terms will permit a creditor to sustain or advance his standard of living, and will encourage further development to continue or enhance the pool available for prudent lending. Let us imagine a forest economy in which two men coexist. The one man has just entered the forest, naked and without many skills or capital. The other man is skilled in hunting, fishing, and homebuilding. The first man meets the other man, whose capital and resources have enabled him to relax and enjoy the product of his labor. The first man envies the other's lifestyle, as he desires to spend his time in relaxation rather than merely laboring most of the day for his own survival. He approaches the other man to offer his prized possession, a paper note which reads $100, in return for some food and a small home. The other man asks, "What can I do with this?" He responds, "It's one hundred dollars." The man asks, "What can it do for me?" He responds, "You can buy stuff with it." The man responds, "We're the only two here. What can I buy from you?" He responds, "I have nothing to offer now, but if you teach me to hunt and fish, I will feed you for two days in the future." Here, the unskilled man is demonstrating dissaving, which is defined as "spending an amount of money greater than available income, or simply borrowing against future income by taking out a loan." The man accepts the offer, agreeing to feed the man, provide him shelter, and teach him his crafts so that he may enjoy a two-day vacation in the near future, all at the expense of his current supply of food and his time dedicated to teaching the man, and at the opportunity cost of either immediate consumption and relaxation or investment in production or in improved methods of hunting, fishing, and homebuilding. Therefore, the $100 note is a promise of value, the figure of which is only thenceforth made relevant by the standard set by the contractual agreement here as a precedent for future agreements. However, the figure carries no practical importance, but in the sense that future forest people may be able to expect a standard of return based on the less arbitrary values assigned to those preceding exchanges of goods and services and the popular terms of promises. In another instance, the unskilled man may have approached the man to offer him his $100 while knowing a third forest person who has manufactured a tool to more easily construct homes. This man may have readily accepted the note in order to convert it into that tool. The debtor note is a promise of relative equal exchange value in the market. The man's $100 income achieves no benefit until it is matched with the craftsman whose tool is valued at no more than that cost: the cost for the buyer being the value of his goods and services rendered to earn that $100 credit, and for the craftsman, the value of his time, labor, and supply used for the creation of this tool. It is important to note that value is arbitrary and relative, but that practical value is achieved in the way that it can be used to advance or accomplish some end. The craftsman's time, labor, and supply could be rendered futile by the man's ill-advised toil in the art of manufacturing toy butterflies made from twigs and leaves. Therefore, commercial value is not simply a function of time, labor, and supply, but is rather a function of perceived advantage in offering those assets in return for something perceptibly greater. Now imagine if a fourth man entered the forest with a collection of $100 bills. By this time, the forest community has established a widely-understood and convenient set of sales prices. However, this man has presumably added nothing to the forest economy, only producing his vast collection of notes. He approaches each of the other three forest men to purchase their supply of tools, food, and shelter. The other three men, accustomed to the established exchange rates, satisfy the man's demand and are unknowingly left with reduced $100 notes, while the other man benefits from their property and labor. The three men in this case are left to chase a reduced, or in some cases entirely depleted, supply of goods with more currency, causing higher prices, reduced purchasing power, and a declined standard of living, practically returning them to a prior state of survival. All of this was the consequence of monetary expansion, or inflation. 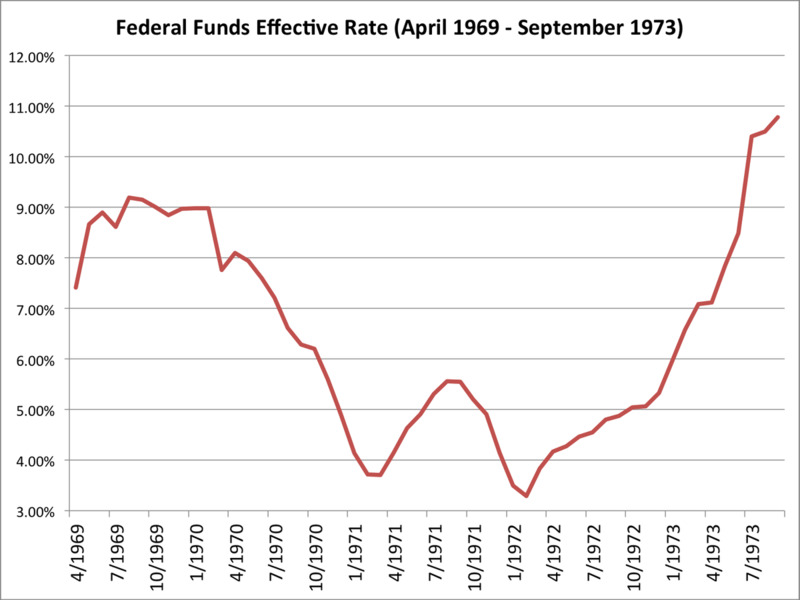 Consider the inflation of the dollar and the federal funds rate since 1971. In 1971, the U.S. dollar was pegged to a value of $35 per ounce of gold. 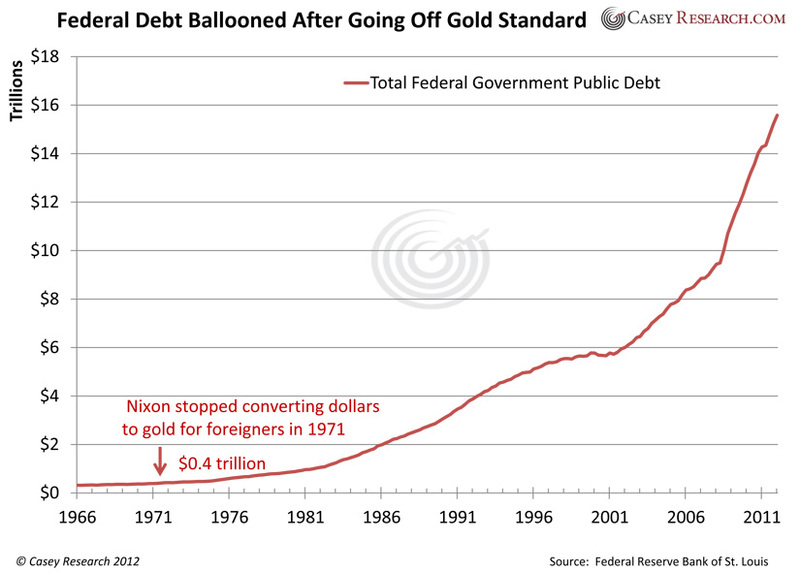 Since then, the United States government has abolished the gold standard and the value of gold as denominated in U.S. dollars has soared to over $1,300. If a person were to have saved in 1971, side by side in a vault, an ounce of gold and $35 in cash, which then carried equivalent general market purchasing power, that person today would be able to convert his gold holdings into one of the following: the highest quality smart TV on the market, over 371 gallons of unleaded gasoline from the local gas station, a nonstop, roundtrip flight from Detroit to Paris, or 271 Big Macs. His $35 in cash today can't even fill up his tank at the local gas station or buy the cheapest microwave oven at Sears. He can, however, purchase 1.7 ounces of silver, while he could purchase 18.6 ounces of silver in 1971. This is the consequence of monetary inflation: distorted market signals, redistribution of savings and purchasing power, and a reduction of the overall standard of living. The first man in the above scenario -- the part of the narrative which is too often overlooked in modern economic theory -- was able to first earn this $100 by proving its value to the craftsman. This is precisely why the man was willing to relinquish his tool in exchange for the note. This promised return of value enables specialized labor and is the mechanism through which commerce is beneficial and desirable for all persons who must always somehow and somewhere participate as both producers and consumers. This is the nature of wealth creation and human action.